But in essensce it is a shock that it happened to anyone at all. 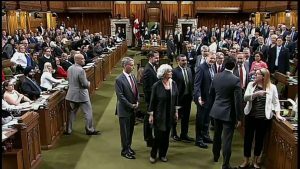 This is the first time I have ever heard about it happening in a Canadian parliamentary session. The first thing that crossed my mind was: was Trudeau trying to out-Trump Donald Trump? In America, high-ranking politicians get goons to beat down undesirables. In Canada, the Prime Minister does the dirty work. Remember that creepy incident between Jean Chretien and that protester over a decade ago? I think that this means that in Canada, the Prime Minister doesn’t order the army to bring order to the state. The person a rabble rouser would really need to fear is the Prime Minister. I mean, no one wants The Shawinigan Handshake done on them. There is a “goon” shortage in Canada. People here are too nice. The Prime Minister is the only nasty one among us. Things cross my mind about Elbowgates, and Shawinigan Handshakes. Political theatre is done with a message in mind. I just can’t see a clear message. The Shawinigan Handshake was clearly political theatre. 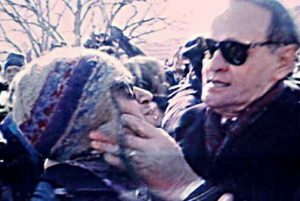 I don’t think that the PM was in any danger, otherwise, Chretien would never be allowed to be that close to a protestor. Both incidents defy logic in a similar way.